Erg Chebbi serves as the common name for a Saharan erg located in the country of Morocco, in Africa. This geological formation also forms one of only two such ergs found in the country. The nearest sizable human habitation also lies roughly 37 mi (60 km) from the boundary of this site. A small tourist center has been established near the periphery of the region. Consequently, overnight excursions reaching a short distance into the area via camel train have become a sizable source of tourism within the region. The edge of Erg Chebbi approximately lines the border with Algeria. 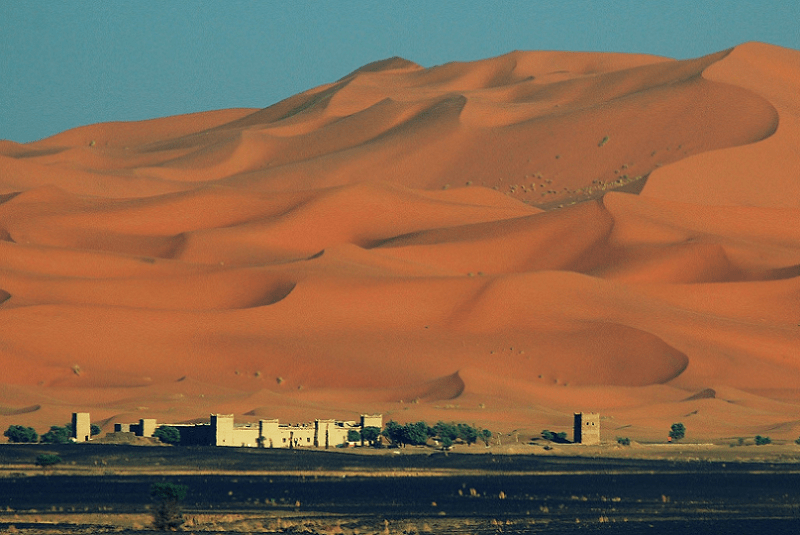 Erg Chebbi represents a rather large dune sea created due to the action of windblown sand. These dunes attain a height of as much as 492 ft (150 m) in some locations. The outline of the region measures roughly rectangular in shape. From north to south it measures around 31 mi (50 km). From east to west it measures nearly 6.2 mi (10 km) in width. The weather of the region remains seasonal and unpredictable. Sandstorms also occur frequently and often arise with little warning. Rainfall within the boundaries of this remarkable site remains highly infrequent. Being typical of such regions, vegetation amid the stark beauty of Erg Chebbi also remains almost non-existent within its boundaries. Fauna also remains extremely scarce. The few species that survive there in sporadic concentrations include pink asphodels, mauve statice, fennec fox, desert hedgehog, and jerboa. In addition, an entirely new, and physically distinctive, species of wolf spider was recently discovered living within the confines of the erg. A preliminary scientific study of this new species remains underway. Therefore, no detailed information about it is available at this time.